Luscious crab cakes made with a pound of lump crabmeat, bound with a creamy Dijon sauce and a light coating of Panko. Great with a dollop of remoulade! If we’ve established one thing in the two years I’ve been running this blog, it’s that I’m not shy about speaking freely when it comes to my food preferences. Read: I’m totally opinionated about what I cook and eat! Sometimes, though, a dish comes along that varies so widely across traditions that it can be difficult to pinpoint a clear favorite. Crab cakes are one of those foods for me. 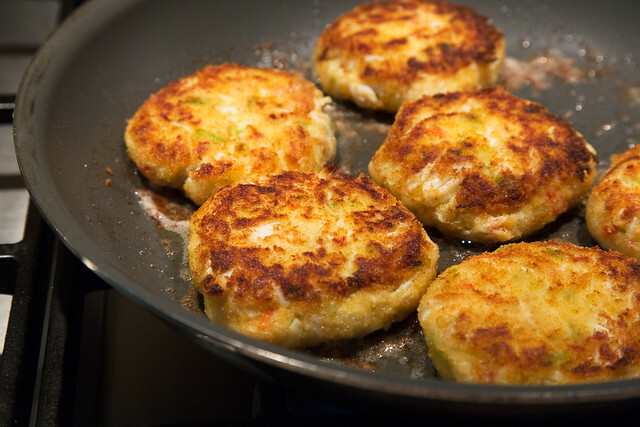 Run a seach for “the best crab cakes,” and you’ll find about as many regional recipes (often conflicting in technique) as there are crabs in the bay. In my quest to find a “perfect” crab cake recipe over the years, I’ve learned that I’m actually an equal-opportunity crab cake eater. Breaded, fried, baked, or broiled, as long as the cakes are made with lump crabmeat (fresh over pasteurized when possible) and don’t contain a lot of other fillers, I’m not going to turn them down. As a result, I have three different “favorite” crab cake recipes, each of which, I believe, has its strong points. Today’s recipe for Roux Crab Cakes is my go-to in the “Breaded and Fried” category. I’ve lost count of how many times I’ve made this recipe over the years. 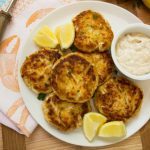 The cakes combine a full pound of sweet lump crabmeat with a creamy base flavored with Dijon mustard and a touch of sautéed aromatics. 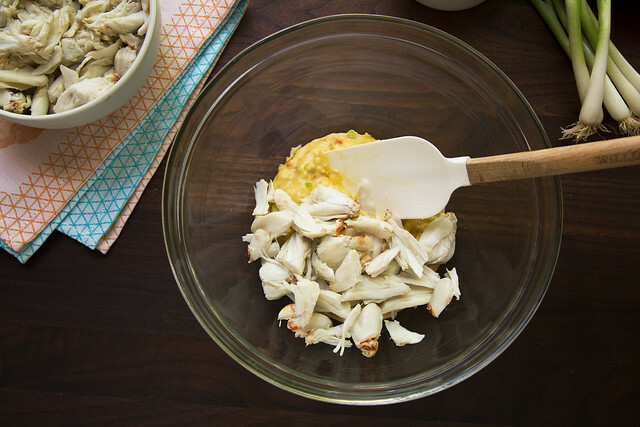 Crabmeat is so delicious and delicate on its own that I tend to be light-handed with the added flavors in all of my crab cake recipes. A thin bread crumb coating gives the cakes a light crunch to contrast their tender interiors. These Roux Crab Cakes are inspired by a recipe I found in the Williams-Sonoma Hors d’Oeuvre book over a decade ago, which bound the cakes with a mixture of whole eggs and reduced heavy cream. The first time I made the recipe, I liked the flavors very much, but found that the cream made the cakes a little on the rich side for my taste buds, and quite delicate to maneuver. Even with a plentiful chill time and breadcrumb coating, I had difficulty getting the crab cakes to hold together in the pan. I’d remembered reading about roux-based cakes, which utilize a heavy béchamel sauce as a binder. So, the next time I made them, I tried swapping out the heavy cream for an equivalent quantity of béchamel (just enough to moisten) with great results. The texture was still creamy, but the cakes were a bit easier to handle. A few additional tweaks and I had a crab cake recipe that’s become a real summer favorite in my house. I still remember one of the first times I made these crab cakes for friends. The cakes were great, but the evening was my first entertaining disaster. I decided to throw a “dinner soiree” as I was heading into my Senior year of college (ever the hostess!). Unbeknownst to me, the (old) electric stove in my apartment conked out in the middle of dinner prep, leaving my main course uncooked when I pulled it out to serve. Ten years later, I still remember the feeling of doom when I saw those sad little (raw) chicken breasts staring back at me from the baking pan. Thank heaven for my platter of crab cakes and the coconut cake my friend had baked for dessert, or we would’ve been calling for pizza. 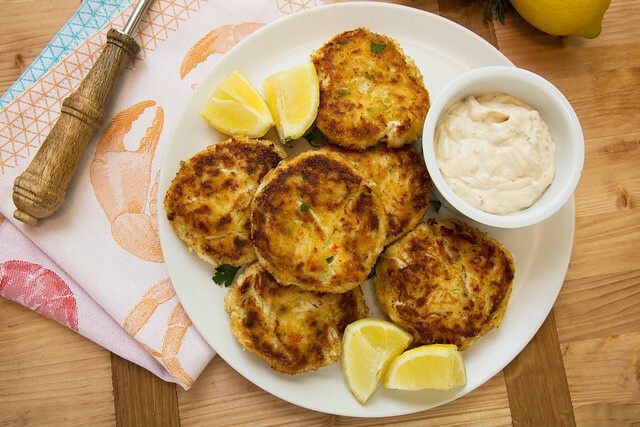 Live, learn, and eat crab cakes whenever possible! Did you know? I have a weekly newsletter! Subscribe to stay up to date on what’s delicious on the blog. Melt 2 tablespoons butter in a medium saucepan or sauté pan until foaming subsides. 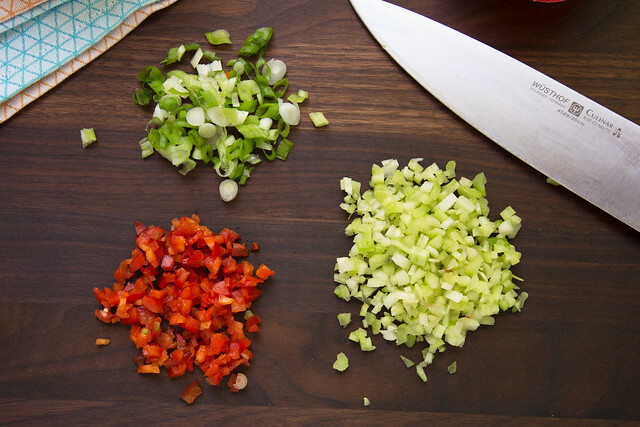 Add celery, scallions, and bell pepper, and sauté until just beginning to soften, about 2 minutes. Stir in flour and cook over medium heat for 1-2 minutes. Slowly whisk in milk and cook, stirring, until very thick and pulling away from sides and bottom of pan, about 2 minutes. Remove from heat and let stand 1 minute. Gradually whisk in egg yolk, followed by Dijon mustard, salt, and pepper. Let mixture cool for 5 minutes. 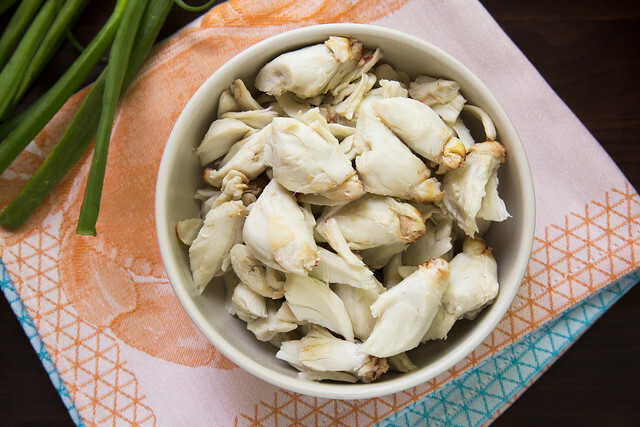 Fold crabmeat into the sauce, gently breaking up the lumps, but leaving some large pieces intact. Shape into 6 cakes (roughly, 1/3-cup each), and coat with breadcrumbs. Cover and refrigerate for at least 1 hour, and up to 3 hours. Heat olive oil and remaining 1 tablespoon butter in a 12-inch sauté pan until foaming subsides. 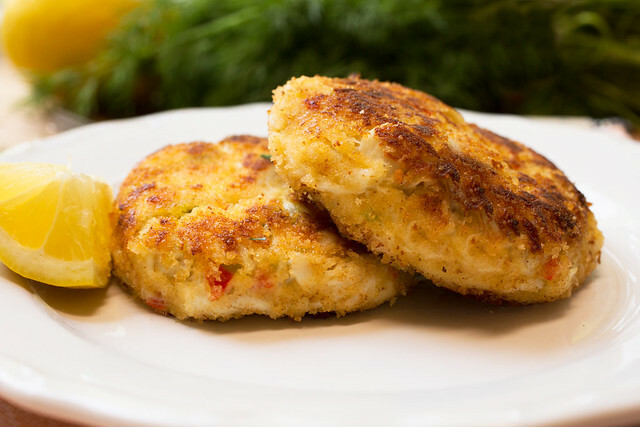 Cook crab cakes about 4 minutes per side until golden brown and heated throughout, using a thin spatula to gently flip. 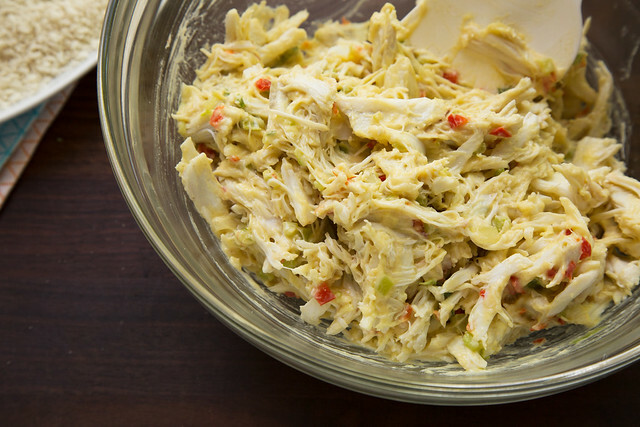 Serve hot with a squeeze of lemon juice and a dollop of remoulade, if desired. 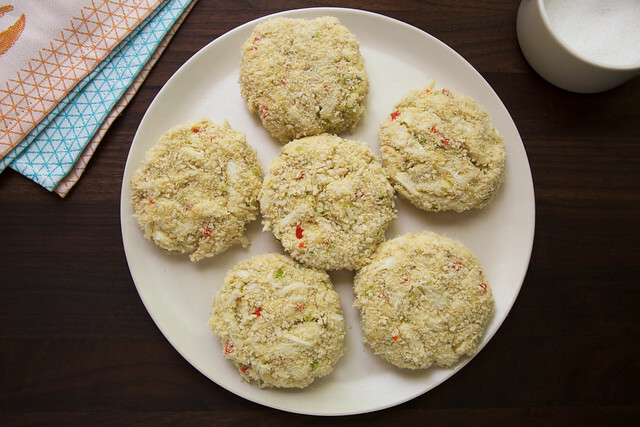 *I love the extra crunch of Panko bread crumbs, but find the texture of most brands too coarse for these crab cakes. So, I like to give the Panko a few pulses in the food processor before breading for a finer consistency. Alternately, you can add them to a zip-top bag, seal, and crush them with a rolling pin. I am an equal opportunity crab cake eater as well and as such, I want a bite of THESE crab cakes. I actually grew up on the Chesapeake Bay – so crab cakes and oysters are literally a part of my DNA. These look fantastic!